I'm tired of MMOs all feeling the same. Guild Wars 2 looks to be doing some things different and moving in a positive direction, but it's still a hotbar MMO with classes in a fantasy setting. I want a departure from the norm. I want to be a dragon. Now here me out. Every MMO I've played has made me play as a humanoid. I don't know if there are MMOs that let you play as anything else at all, unless you count playing as a ship in EVE Online or STO. But I want to be something more. Let me be the dangerous predator in the night. 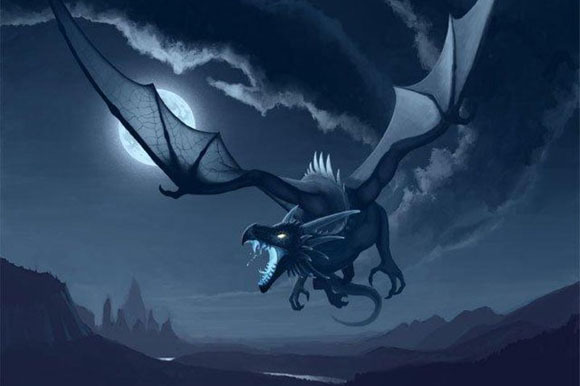 Let me soar above humans, breathing fire and striking fear into their hearts. Let me swoop down and snap a humanoid in two with my jaws. Let them form raids in a pathetic attempt to destroy me. Let them try to unseat me from my hard earned pile of treasure. Let me be the terror at the end of the dungeon. The idea of switching around the roles of Player Characters and NPCs is simply fascinating to me. There's a lot of untapped potential in different roles yet to be explored. I hope someone decides to explore it. Horizons (or Istaria) allows players to play as a dragon. However, it doesn't do much to swap the roles of PC / NPC, or attacker / defender. It's funny that you mentioned that. A friend and I were recently discussing an idea for a game where you played the villain. Not an anti-hero, not a "morally dubious" character, but the actual villain. Like the leader of the henchmen who is supposed to lay traps for Batman! Expand that idea to something like Skyrim, where you get to be the dragon, who just wants to live, and not be killed again by the stupid Dragonborn. What would you to to ensure the survival of your species?